The Presbytery adjoining the Church was originally built as a private house on the site of the old Wricklemarsh Manor. It was built in 1787 for Captain Thomas Larkin, using some of the land and stone from the old manor. It is a Grade Two listed building and is one of the oldest buildings in Blackheath. Local historian Neil Rhind describes it as the best. Larkin’s house stood on high ground, with splendid views across the valley of the Kid Brook, across the roads of a small hamlet of two or three houses and a pub or two, over the Heath towards London. 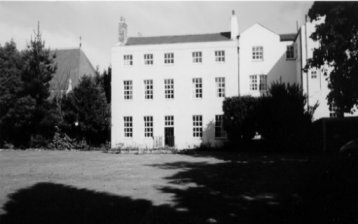 In the 1870s Larkin’s house was bought for a Catholic orphanage, and it passed, eventually, into use as the priest’s house for the church next door. To the south the Presbytery overlooks a large garden with lawn and several mature trees. Children enjoy playing in the garden when supervised by parents after 9.30 Mass on Sundays. The garden also provides a lovely space for parish parties in the summer and for wedding photographs.